1974 - Kenny Walton of Cedar Rapids, Iowa, nearly made it a clean sweep as he grabbed late model feature honors at Freeport, Illinois on Sunday evening, July 28. 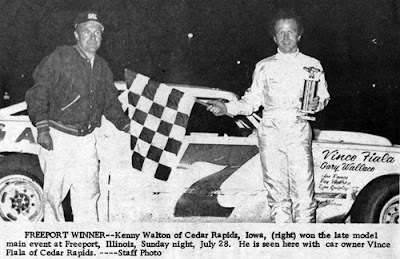 Walton took home wins in the trophy dash, third heat and feature but had to settle for second fastest in time trials, losing that to John Connolly of Delhi, Iowa, who sped around the big half-mile in 26.40 seconds. Walton battled to take the lead from Ron Greenlee in the feature, finally securing the top spot on lap 7. Walton couldn’t shake Greenlee, however, and finished a car length ahead at the checkers. 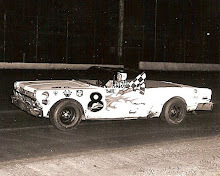 In turn, Boyce Sparkman was right on Greenlee’s bumper the whole time and took third. 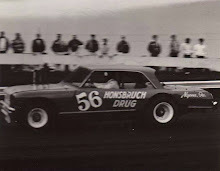 Don Bohlander and Connolly rounded out the top five. 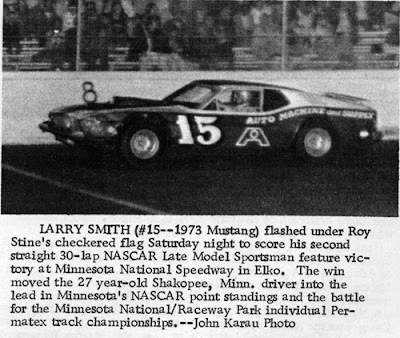 1973 – Starting from the very back of the field, Larry Smith of Shakopee, Minn., pushed his 1973 Mustang Fastback through the field and won the NASCAR late model 30-lap feature at Minnesota National Speedway in Elko, Minn., on Saturday, July 28. 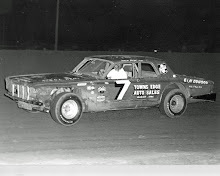 Smith, the evening’s fast qualifier, went quickly into battle and relentlessly worked his way through traffic, reaching second place by lap 27. On the white flag lap, Smith charged past race-long leader Mike Miller of New Prague, Minn., and went on to take the checkers for his second straight victory. Smith’s victory also propelled him into the NASCAR Minnesota state point lead over Dan Prziborowski, 1,126 to 1,108. 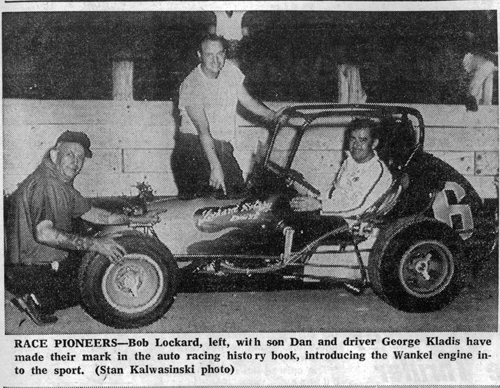 1972 – National auto racing history was made at Illiana Speedway in Schererville, Ind., on Friday, July 28, as George Kladis won the United Auto Racing Association 25-lap feature piloting the revolutionary new Lockard Wankel rotary engine. It marked the first time a Wankel engine won a feature in the United States. The brainchild of engineer Bob Lockard, the Wankel was a highly-controversial power plant. It was a rotary combustion engine that could be classified as a baby turbine, although its working functions were totally original. The Wankel was a radical departure from the four, six and eight cylinder engines developed in Detroit, Mich. Designed by German engineer Felix Wankel in 1930; it was rarely used until 1966. Lockard’s experiment was to prove that the 60-cubic inch engine could be refined to compete with and beat engines two and a half times bigger. The Wankel’s biggest asset was its size and weight. In comparison with the popular Chevy II engine used in most midget cars, the Wankel, at 200 pounds, was 85 pounds lighter and half the size. 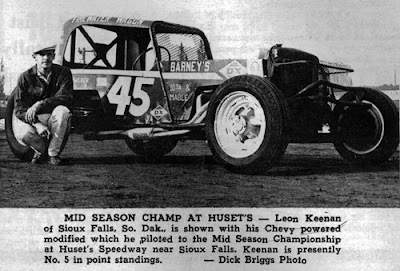 1968 – Leon Keenan of Sioux Falls, S.D., won the 50-lap modified mid-season championship at Huset’s Speedway on Sunday, July 28. Keenan overtook race leader Bill Weinkauf on a late restart and held off both Weinkauf and Marlin Hanten at the checkers to earn the winner’s share of the $3,429 purse. 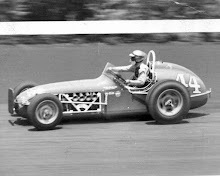 Jim Klasse took a commanding lead and won the 25-lap “B” feature, in what was a grand slam night of racing, as he also won the first heat and the first trophy dash. 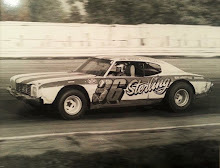 Bud Berger was a double winner on the night, scoring the victory in the fourth heat and second trophy dash.